ISTANBUL -- A suicide bomber affiliated with the Islamic State of Iraq and Syria (ISIS) detonated a bomb in a historic district of Istanbul popular with tourists Tuesday morning, killing at least 10 people -- nine of them German tourists -- and wounding 15 others, Turkish officials said. Turkish Prime Minister Ahmet Davutoglu said the bomber who carried out the attack in Istanbul's Sultanahmet district was a member of ISIS and pledged to battle the militant group until it no longer "remains a threat" to Turkey or the world. Davutoglu described the attacker as a "foreign national." Deputy Prime Minister Numan Kurtulmus had previously said the perpetrator was born in 1988 and was a Syrian national, but the private Dogan news agency claimed the bomber was Saudi-born. "Turkey won't backtrack in its struggle against Daesh by even one step," Davutoglu said, referring to IS by its Arabic acronym. "This terror organization, the assailants and all of their connections will be found and they will receive the punishments they deserve." In Washington, the White House also condemned the attack. "This heinous attack occurred in Istanbul's historic heart, and struck Turks and foreign tourists alike," National Security Council Spokesperson Ned Price said. "Our thoughts and prayers are with the families and loved ones of all those who have been killed and with those injured." Davutoglu said the death toll of 10 did not include the suicide bomber. Jostein Nielsen, from Norway, was hit by shrapnel from the bomb, reports CBS News' Holly Williams. "We were splattered," said his wife Magna. "Our clothes, my jacket was spattered with burnt human remains." 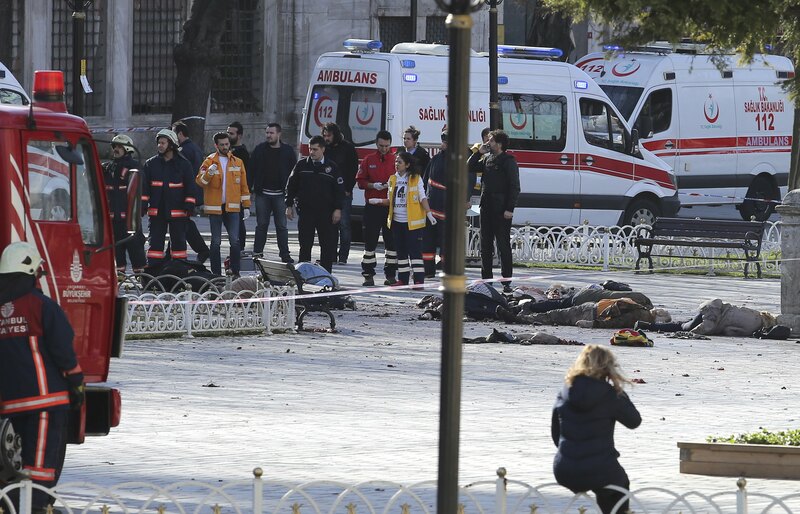 The explosion, which could be heard from several neighborhoods, was at a park that is home to a landmark obelisk, some 25 yards from the historic Blue Mosque. Last year, Turkey agreed to take a more active role in the U.S.-led battle against ISIS. Turkey opened its bases to U.S. aircraft to launch air raids on the extremist group in Syria and has carried out a limited number of strikes on the group itself. It has also moved to tighten security along its 560-mile border with Syria in a bid to stem the flow of militants. Halil Ibrahim Peltek, a shopkeeper near the area of the blast told The Associated Press it had "an earthquake effect." "There was panic because the explosion was violent," he said. Turkey has been hit by a number of attacks during the past year, the worst of which have been claimed by ISIS. Turkish police detained two suspected ISIS militants at the end of December believed to be planning suicide attacks during New Year's celebrations in central Ankara. Police seized a suicide vest armed with a bomb and an explosive device fortified with ball bearings and metal rods, and bomb-making equipment, according to the Ankara Chief Prosecutor's office. In October, two suicide bombers detonated bombs outside Ankara's main train station as people gathered for a peace rally. The attack killed more than 100 people and was Turkey's deadliest. The prosecutor's office said the attack was carried out by a local ISIS cell. More than 30 people were also killed in an ISIS suicide attack in the town of Suruc, near Turkey's border with Syria, in July.